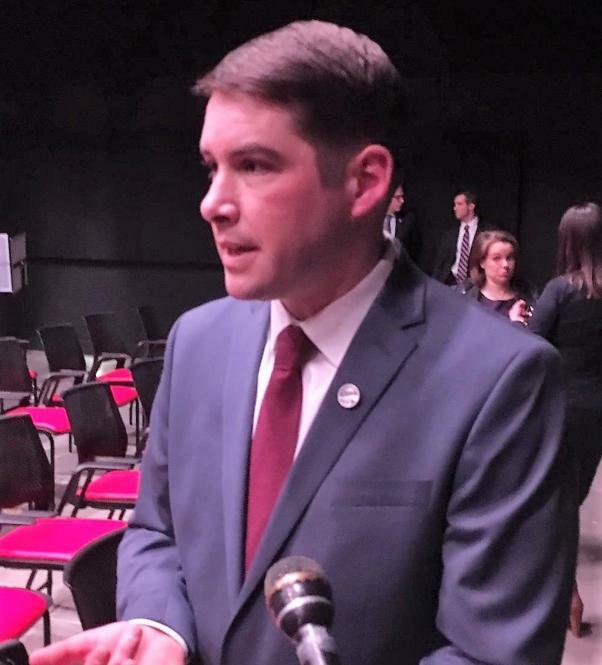 Mayor Ben Walsh delivered his second State of the City address on Thursday. He told a packed Redhouse Theater that the city continues to face many of the same challenges, but now has a better handle on them. Much of the speech focused on seizing and building opportunity. That presented itself in a big way when Governor Cuomo committed strong support for a strategy called “Syracuse Surge.” Walsh says it will jumpstart high-tech investment in the neighborhoods immediately south and east of downtown. "The predominant feature of the campus will be a new regional science, technology, engineering, arts and math, or STEAM, school," said Walsh. "It will be built in a fully restored and modernized Central High School, a historic gem that has awaited reuse for decades. The school will capatalize on the city's successes in career and technical education making it available to students from districts throughout the region." Walsh says the “southside campus” as it’s called will have best-in-class broadband to provide the ability to teach and learn in innovative vocational programs. The multi-year surge projects will be fueled by more than 200 million dollars in public and private funding already committed, with more likely on the way from the state. Walsh mentioned there will be more opportunities through the Syracuse Build program launched last year. Centerstate CEO’s Work Train initiative has received a major grant aimed at putting residents to work. "The funding: $200,000 a year for three years will support inclusive workforce development initiatives throughout the city," said Walsh. "Syracuse University has agreed to become the first private sector anchor project partner for Syracuse Build. The University will join the city and county in committing to work with its project partners to create more job opportunities for local, minority and veteran workers on our job sites." Walsh says will also include the massive I-81 replacement project. Financial stability for many working families, though, is out of reach. Residents often don’t have a cushion of cash that protects them from losing an apartment or car. Walsh says the answer might be with a financial empowerment center. "The service will help families create and build the kind of assets that can help them weather unexpected events, and separate themselves from the risk of falling into poverty," Walsh said. "This is critical for Syracuse. Almost 75% of households struggle to afford basic neccesities like housing, transportation, childcare or food even when employed." The center will open in April, and Syracuse will be one of only 15 cities to have one. Overall, Mayor Walsh expressed confidence in the city’s future, saying the best days aren’t just ahead of it, but are within reach. He's hoping to build upon the progress of his first year in office while also recognizing significant challenges still lie ahead. Walsh noted one of them is finding ways to address the gun violence that took the lives of so many teenagers and children in 2018. As a father and mayor, he says he's outraged, shocked, and saddened. "It is immensely difficult, though, to break such cycles of violence. Lasting change will take time. But there is a lot we are doing to make people's lives safer and better now." Walsh says new police chief Kenton Buckner is preparing to reorganize the department in noticeable ways. "He will move core policing functions closer to the neighborhoods and the people we serve. The chief will increase uniform patrol, so you'll see greater police visibility and a push to reduce waiting time for calls for service. And, he's creating a new public information system to improve communications with residents." Buckner will have some help…32 new officers just graduated from the academy and are patrolling the streets. But Walsh says that barely off-sets the impact of retirements, so another class of officers is in the pipeline. With a big winter storm bearing down on the region, many residents might wonder if plows are up to the task. Walsh says they’re all now equipped with GPS style devices. "DPW put the new technology to work in the most recent storm. In doing so, they were able to accurately where plows had been, and deploy crews more efficiently. If the performance last week is any indication, it's working. We're not where we want to be yet, but with each event, we are making progress, and we are going to keep getting better." Come spring, potholes are inevitable. Walsh says they hope a new asphalt solution they’re testing will prove to be a more permanent fix. Also this spring, a new transportation option will be available. "When the warmer weather arrives in April, we will have 200 Syracuse SYNC bicycles on the streets. People can use them to get to work, go shopping, or just take a ride. SYNC bikes can be left at designated mobility hubs that will be located in neighborhoods across the city for another rider to use." Riders can pay per ride or sign up for low cost memberships. The bike share program is a collaboration between Gotcha Bike, Adapt CNY, and the Syracuse Bikeshare Commission. What could have become a contentious, divisive issue has ended with a proposed sales tax agreement that appears to please both city and county leaders. "The agreement hasn't changed," said Onondaga County Executive Ryan McMahon. "We're proposing to extend it another 10 years off of the last year of the existing agreement." "It was a very good deal in 2010, and it's a very good deal in 2018,” said Syracuse Mayor Ben Walsh. Syracuse City officials say they too are mourning the loss of a 12-year-old boy tragically shot and killed on John Street Wednesday night. They’re now asking for community support to provide information and band together to stop the violence. The murder of a 12 year old boy on John Street Wednesday Night has the Syracuse community calling for support of those who are grieving.